A homeless teenager was found sleeping in a tent outside the university where he was studying biology. Fred Barley, 19, had cycled for around six hours on his little brother’s child-size bicycle, in the searing heat of the American south, to register for classes at Gordon State College. The journey, from his family home in Conyers to the college town of Barnesville, was more than 50 miles across the US state of Georgia. Once registered for classes, he stayed in a tent he’d pitched on campus and searched for jobs in the daytime. He had two duffel bags and two gallons of water with him, but nothing to eat except for a box of cereal. Fred was eventually discovered by police officers, who were so impressed by his ambition and determination to study that they put him up in a motel room. ‘He was so understanding and he said, “I definitely applaud you for doing this. We can’t allow you to stay here, but I have somewhere you can stay,”‘ Fred told WSB-TV. Fred’s story soon travelled, and it wasn’t long before people were donating clothes, school supplies, shoes, money and a new bike. Someone also offered him a job washing dishes at a local pizza places, which he has now started. Casey Blaney, who lives in Barnesville, set up a GoFundMefor Fred that has since raised more than $115,500. And while Fred is enjoying his job and college course for now, his long-term plans are even more ambitious. Once he graduates, he wants to go medical school and become a doctor. Its been shared onEllenNation too, you can vote on too. Check how we can nominate fred to be on Ellen Show. We the fans of ellen are nominating him as a deserving person and send it to ellen, click here to know the procedure. 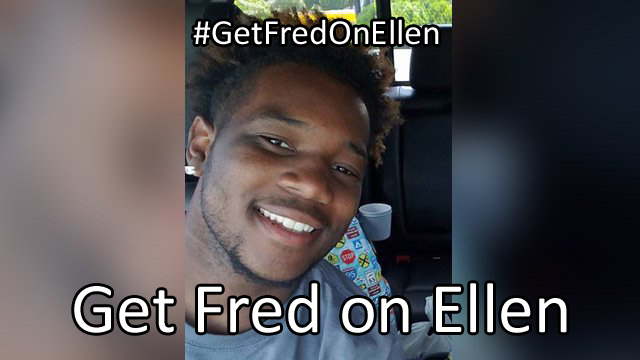 Let the Hashtag #GetFredOnEllen circulate on your wall. Signup to our newsletter, so that we can share the future news of fred with you.